First you were forced to reach for an umbrella instead of the sunscreen. Then blight blasted your tomatoes, and the daisies drowned. In June and July, when the recession dampened travel plans to exotic destinations, Mother Nature offered you little more than indoor board game weather and mud. But New Englanders, a blazing crimson, gold, and orange reward is about to be yours: That miserable soggy start of summer and the crisp, clear conditions now are the essential ingredients for what promises to be one of the most spectacular foliage seasons in recent memory. Already, isolated areas of northern New England may hit peak color this weekend, before nature’s paintbrush meanders south. Tourism officials and business owners are downright giddy at the prospect of a surge of “staycationers’’ and far-flung leaf-peepers. A Maine foliage hot line is fielding three times the number of calls it normally gets from tourists. “We are off the Richter scale,’’ Gary Armitage of The Balsams Grand Resort Hotel in Dixville Notch, N.H., said of the conditions there, near the Canadian border. The hotel’s vice president of sales and new business development, he said last-minute reservations are flooding in. Of course, there is a longstanding truth about foliage forecasts from those with a stake in the season: It’s always going to be a good year. Even when the leaves were downright dull in 2005 and 2007 in many places, predictions were for an impressionist palette so breathtaking that tourism officials seemed to suggest missing it would be a lifelong regret. But this year, even scientists say the predictions are on track to be true. The soggy spring allowed the region’s maple, ash, oak, and other trees to grow bushy with broad green leaves, which are providing larger-than-normal canvases for color. Now, as lengthening nights signal trees to begin shutting down for the winter, the succession of warm, sunny days and cool - but not freezing - nights is providing a foundation for riotous hues. Here’s how: Cells in the bases of leaf stems begin to die, forming a barrier that prevents many nutrients from reaching the leaf. Chlorophyll, the green pigment in leaves, begins to break down, revealing yellows the green was masking. Those colors tend to stay fairly constant each year, but late summer’s and early autumn’s warm, sunny weather allows leaves to produce another pigment - anthocyanin - the source of vivid reds, purples, and crimsons. When they combine with the yellows already present, outstanding oranges arise. “The intensity, the quality, is determined by the growing conditions at the time the tree enters dormancy,’’ said Peter Del Tredici, a senior research scientist at Harvard University’s Arnold Arboretum. Why would a tree that is about to drop its leaves expend so much energy to produce such brilliant reds? Scientists have a leading theory - sunscreen. Without chlorophyll to absorb sunlight, the leaf is being bombarded with solar radiation. The red pigment may be a “defense response,’’ said Michael Dosmann, curator of living collections at the Arboretum. Millions of visitors - and dollars - come to New England each year to savor this stunning curtain-raiser to winter. In Vermont, tourists spent about $375 million between September and November in 2007, the most recent data available. The state gets its greatest proportion of overseas visitors during autumn, and this year the state is also being inundated with requests from Texans, running “contrary to the conventional wisdom in the tourism industry that leisure travelers will stay closer to home this year,’’ according to Gregory Gerdel, research and operations chief for Vermont’s Department of Tourism and Marketing. Taking nothing for granted, states and communities are aggressively courting visitors, with tourist hot lines, festivals, and online maps showing where the best viewing is in all of the New England states. New Hampshire hotels, inns, and bed-and-breakfasts are offering a suite of foliage deals, and Massachusetts has webcams to help leaf lovers track the color. Hot lines and hotels get one persistent question from leaf-peepers: Where - and when - will the leaves peak? The answer is not easy. Even when the elements for a perfect season are all there, an early frost could fizzle the show. A string of overcast days may make the trees more muted gold than fiery red. Leaves do seem to be turning about a week earlier than usual, foliage watchers say. Some have reported blazing single trees from Brockton to Bangor, although they are surrounded by others of the same species that remain green. 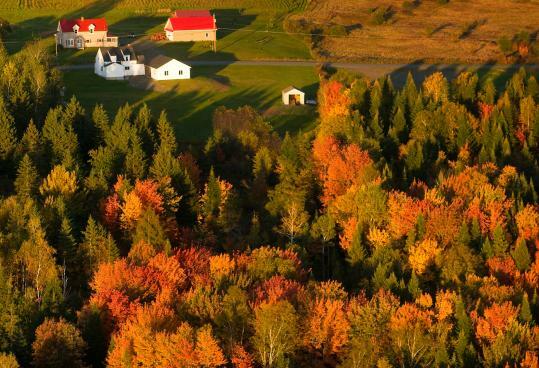 Scott Thompson, manager of Aroostook State Park in northern Maine, says colors are “beginning to pop’’ and could reach peak this weekend, in time for a planned foliage hike today. Foliage is expected to hit peak in many parts of Vermont by early to mid-October, with colder places on ridges and mountains and in valleys turning first. The rule of thumb in many places is that the best foliage tends to coincide with Columbus Day weekend.